Ase – What is it? Ase is a force that assures dynamic existence that permits events to unfold. Without Ase existence would be paralyzed, and devoid of all possibility of realization. It is the\principle that makes possible the vital process. Like all force, the Ase is transmissible, and is conducted by material and symbolic means, and it is able to be accumulated. It is a force that can only be acquired by introjections or by contact. It can be transmitted to objects or to human beings. According to Maupoil (1943: 334), this term in Nago (Yoruba) means -an invisible force, a magical-sacred force of all divinity, and of all things. But this force does not appear spontaneously: it must be transmitted. All objects, beings, or consecrated places exist only through the acquisition of Ase. It is understood that the Ile, it material contents and initiates must receive Ase, accumulate it, maintain it, and develop it. The principle of ase and force is neutral. It can be transmitted and applied to diverse finalities, or realizations. The combination of the material and symbolic elements that contain and express the ASE of the terreiro varies more from that which characterizes each orisha or the ancestors… The quality of the ASE varies according to the combination of the elements that it contains and carries; each one of them is a transporter of a cargo, of energy, of a power that permits determined realizations. Once the ase is planted in the terreiro, it expands and fortifies itself, combining the qualities and signification of all the elements of that which it is composed. a) The ase of each vodun orisha nkisi is planted in the peji (altar) of the hounfo (ile-orisha), and realized through the offerings and of ritual action, transmitted to its olorisha by the intermediary of initiation and activated by individual. b) The ase of each member of the ile, nzo terreiro that adds to that of its orisha received in the decorum of the initiation, of his individual destiny, the ase that she shall accumulate in the interior, the inu that she shall revitalize through the rites of bori (offering to the head) To which is added the ase inherited from the ancestors. Ase like all force can be diminished or augmented. These variations are determined by the scrupulous observation of the duties and the obligations, which are rules by the doctrine and the liturgical practices, of each holder of the ase…. We can in this practice, enunciate one of the essential characteristics of the nago (YORUBA) system: to each spiritual or abstract element there corresponds a material, or corporal representation. The force of ase is contained and transmitted through certain material elements of certain substances. The ase contained and transferred by these substances are the beings and the objects maintained and renewed in them power of realization. C) the red blood provided by the mineral kingdom; copper, bronze etc. Yellow is a variety of red as green and blue are varieties of black. C) The mineral kingdom provides: coal charcoal, iron, etc..
To receive ase means to incorporate the symbolic elements that represent the vital and essential principles of all that which exists, in a particular combination that individualizes and permits a determined signification. It is an endeavor to incorporate all that which constitutes the aiye and the orun, this world and the world beyond..
Ase corresponds to the Arabic Baraka, to the Mana of the Melanesian and Polynesian, the Ordenda of the Iroquois, to the Manitou, of the Algonguin. The Ase of the Vodunon is the power that he or she exercises over the Vodun. 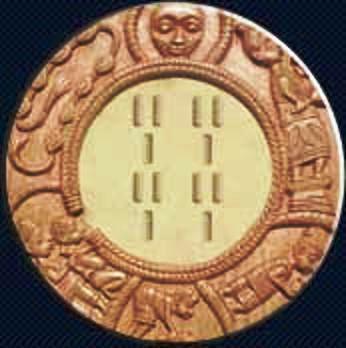 The ase of the Azeto is the power that he exercises over persons not immunized against the Amulets; The ase of the Bokonon (Babalawo) extends over the entire world. Two persons, at least, are dispensable for the initiatic transmission. The ase and the knowledge pass directly from one being to another, not by explanation or logical rationalization, on a conscious and intellectual level, but by the transference of a complex code of symbols in that dynamic relation constituting the most important mechanism. The transmission is effectuated through gestures; spoken words accompanied by bodily movement, with the breathing and the breath that gives life to inert material and attain the most profound plane of the personality. (Abrir a Fala), open the mouth to speak, will permit the divinity to enter into communication with men…The ke is the synthesis and an affirmation of individualized existence.